Hope you all had a great weekend! I popped in on Saturday to share a review of a fantastic new brand of compression socks, so if you missed my review, be sure to check it out! As I mentioned in one of my previous posts, one of the things I have been looking forward to most is getting back to running some speedy 5ks now that my marathon season is over. I’m very excited to officially have a few races on my calendar as part of that plan! Next Sunday, I’ll be running the Boston River Run 5k. Given that it’s along the Charles, it should be flat and fast. I’m very curious to see how my legs will handle it. I ran a different 5k along the Charles shortly after Delaware and hit a pretty big PR, so I’m wondering if I will see a similar effect this time around? Honestly, I don’t have any expectations though. I really want to use it to gauge my current fitness level. I also signed up for a local Turkey Trot 5k for Thanksgiving. That course should have a few rolling hills in it, but I just want to have fun and get a little exercise in before feasting with my family. 🙂 Then in December, I’ll be running the Cambridge Yulefest 5k. This race is HUGELY popular with my running club and pretty much everyone I’ve talked to about it has said that it’s an absolute blast, so I’m pretty excited for it. So 3 5ks in 2 months! Praise the lord for short races with quick recovery times. I eased back into some running this week, but so far, I’ve still been keeping the mileage pretty low and most of the runs on the easy side. Monday – I flew home so no workout. But it felt good to come home to Boston! Tuesday – An easy 4-miler on my regular route. I ran in the early afternoon and it felt great to finally be back at it. Wednesday– I ran home from work. I LOVE that I can get in a nice, 4.5 mile run from my office! I wish I had done this sooner! I was treated to this pretty epic view which just made it that much better. I’m beginning to think Boston might just have the prettiest sunsets ever. Thursday – Speed workout with my running club. It has been ages since I’ve been to one of these workouts! Between my travel schedule and marathon training, I hadn’t been there in MONTHS. Now that things have slowed down at work, I’m really looking forward to attending these workouts and getting more involved in the club. Friday – Much needed rest day. I was a little sore from the workout the day before, so I think my legs needed the rest. Saturday – Another easy 4-miler. There’s nothing like running in the Fall. My route is looking gorgeous! Overall, my legs are feeling pretty good. I’m looking forward to starting to incorporate some harder workouts, some races, and to start slowly increasing my mileage again. How was your week? 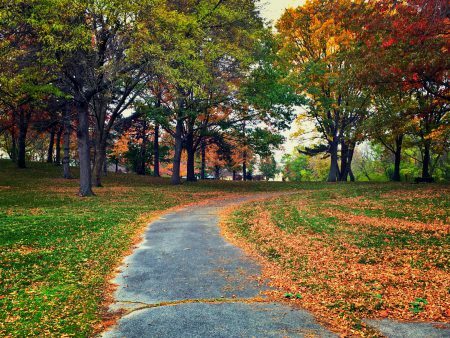 What’s your favorite part of Fall running – cooler temps, beautiful scenery, something else? This entry was posted in Uncategorized and tagged 2 Generations Running, 5K, Boston, Running, Training. Bookmark the permalink.